ERC (ERTH, HERYGH, URITH), (in Cornwall 31st October), St. Erc mac Dega (Latin: Ercus; Cornish: Erth) is believed to have been a pagan druid converted by St. Patrick (17th March), who later consecrated him first Bishop of Slane, Co. Meath, Ireland. According to tradition, St. Erc founded the original Abbey on the Hill of Slane as well as the school at Slane Abbey, where King St. Dagobert II (23rd December) is believed to have received part of his early education. St. Erc was also a friend and tutor of St. Brendan the Voyager (16th May). Around 450 St. Erc was chosen by St. Patrick to continue St. Benignus of Armagh's (9th November) evangelisation of Co. Kerry, when the later was sent to Northern Co. Clare and the present-day Province of Connaught. Initially St. Erc's jurisdiction appears to have included a large part of south-west Co. Limerick, including the monastery of St. Ita (15th January) at Killeedy. Shortly before his repose, St. Patrick expanded the area over which St. Erc was responsible to include Co. Cork, thereby placing most, if not all, of the area that comprises present-day Province of Munster under St. Erc’s supervision. St. Erth of Cornwall is generally believed to be the same man as St. Erc. Brother of SS. Uni (17th September) and Ia (3rd February), he is thought to have crossed from Ireland to Cornwall, where a church and the village of St. Erth are dedicated to him. This is based upon local tradition, supported only by fifteenth-century English chronicler William of Worcester’s note from 1478: “Saint Herygh, the brother of Saint Uny, a bishop, lies in a certain church situated under the cross of the church of St. Paul in London; his day is kept on the vigil of All Saints, that is, the last day of October ... Saint Hya ... the sister of Saint Herygh ...” Herygh is an incorrect corruption of St. Erc’s name, and the reference to St. Paul’s is undoubtedly the result of confusing St. Erc with St. Erconwald (30th April). St. Erc spent the last years of his life in prayer and solitude at a hermitage in Slane. According to the Annals of Ulster , St. Erc reposed 2nd November 512. His feast is kept on 2nd November in Ireland and on the calendar of the Moscow Patriarchate, and on 31st October in Cornwall. that being blessed with the virtue of humility/ we may be found worthy of eternal salvation. GEORGE of VIENNE, a late seventh or early eighth century Bishop of Vienne. JUSTUS of TRIESTE, a citizen of Trieste, St. Justus was arrested for being a Christian during the Diocletianic Persecution (303). Subjected to torture he still refused to renounce Christ and so was weighted down and thrown into the sea where he drowned. PUBLIUS, VICTOR, HERMES and PAPIAS, (Date Unknown), martyrs in North Africa of whom the only information extant is their names. VICTORINUS of PETTAU, Bishop of Pettau in Styria (Steiermark in present-day Austria), according to the Martyrologium Hieronymianum , St. Victorinus was the first theologian to use Latin for his exegesis. Though it appears he was a prodigious writer, an extremely limited selection of his work survives to the present. 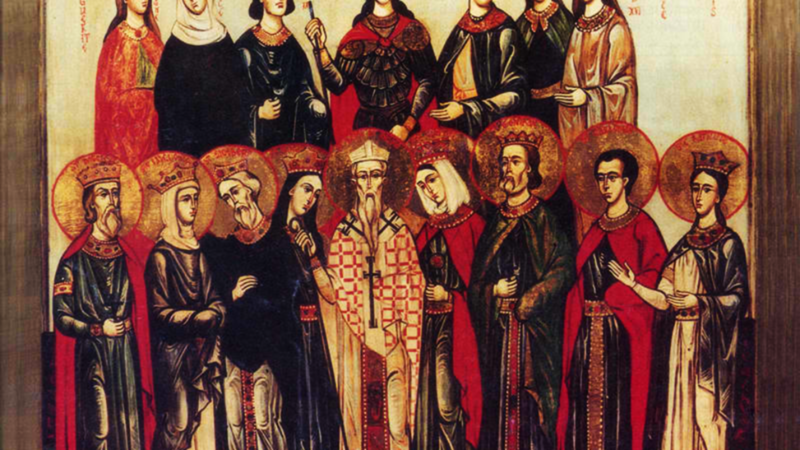 St. Victorinus was martyred during the Diocletianic Persecution circa 304.